The individuals profiled in this volume are the authors' considered choice of Jewish women who have had great impact in their respective fields. Among these outstanding personalities, one will find the biblical Deborah and the late Israeli prime minister Golda Meir, women who led their nation in war; U.S. Supreme Court Justice Ruth Bader Ginsburg; Nobel Prize-winners Rosalyn Yalow and Nelly Sachs; singer/actress Barbra Streisand; playwrights Lillian Hellman and Wendy Wasserstein; business tycoons Helena Rubenstein and Estée Lauder; and U.S. Senators Barbara Boxer and Dianne Feinstein. In each of the biographies, Elinor Slater and Robert Slater describe the subject's unusual gifts and achievements, noting, when relevant, her relationship to Judaism and the Jewish people. The Slaters believe that while women in general have had to overcome discriminatory barriers in order to succeed in their various pursuits, Jewish women have often had to overcome a double measure of discrimination: one involving their gender and the other their religion. Hence, while all women who have achieved success and made a contribution to society deserve acclaim, Jewish women are doubly deserving. And it is for this reason that the authors undertook this project: to give special recognition to those Jewish women who have persevered and succeeded, sometimes against great odds. As United States Supreme Court Justice Ruth Bader Ginsburg writes in her introduction to Great Jewish Women, "This collection will have served its purpose if its readers come away from it with an enhanced appreciation that, with a strong will and hard work, one can overcome artificial barriers and turn dreams into reality." With black-and-white photographs. "The perfect Bat Mitzvah gift." 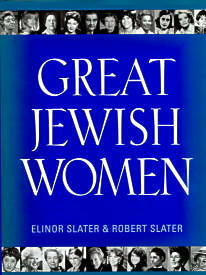 Robert Slater and his wife, Elinor Slater, are coauthors of the highly popular Great Jewish Women, Great Jewish Men, and Great Moments in Jewish History. Robert Slater was a reporter in the Time magazine Jerusalem Bureau from 1976 to 1996. He is also the author of Great Jews in Sports, Rabin of Israel, and Golda: The Uncrowned Queen of Israel. Elinor Slater has worked for the Hebrew University of Jerusalem as the coordinator for U.S.-sponsored research programs since 1982. She has helped in the editing of all her husband's books and is active in the Israel Women's Network. Elinor Slater, born in the United States in 1944, and Robert Slater, born in the United States in 1943, have been married since 1966. In 1971 they moved to Jerusalem, where they continue to make their home. The Slaters have three children, all of whom live in Israel.